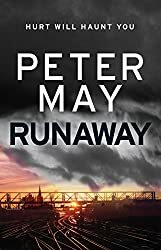 Runaway by Peter May is one of the books I’m thinking of reading this month. I’ve read some of his other books, the Lewis Trilogy and Entry Island and thoroughly enjoyed them, real page-turners. So I’m hoping that Runaway will be just as good. He wakes in a cold sweat from a dream pervaded by darkness and blood. And after a lifetime of being someone else in another land, he wonders who he is now. This man, who, he knows, is fading all too soon. A life squandered for a love lost. A life that seems to have passed in the blink of an eye. Jack stepped down from the bus almost at the end of Battlefield Road and raised his head towards the darkening sky with a sense of foreboding. He took in the brooding silhouette of the smoke-stained Victoria Infirmary that climbed the hill above the field of battle where Mary, Queen of Scots, was once defeated by James VI, and felt as if someone had just walked over his grave. Now, reading this, I am keen to read on. Flicking through the book I can see that it alternates between 1965 and 2015. The back cover reveals that in 1965, five teenage friends fled Glasgow for London to pursue their dream of musical stardom. Yet before year’s end three returned, and returned damaged. In 2015, a brutal murder forces those three men, now in their sixties, to journey back to London and finally confront the dark truth they have run from for five decades. This sounds really beautiful. And I always like it when the author moves between different time periods, as long as they manage to differentiate them properly. I hope you enjoy this one! Thanks for sharing 🙂 I hope you have a great week! Ooooh, sounds great. I like May, but haven’t read this one. I like Peter May’s work very much, Margaret. So I admit, I’m biased. Even so, I really hope you’ll enjoy this one. Not to be a wet blanket, but I’ve read everything from Peter May, and given 4, 3 and 2 stars…this was almost 2.5, for me. He writes well, of course, but I could not become invested in the characters in this novel. It just fell flat for me to the point of tedium and boredom. I ended up skimming a lot because I did want to know ‘whodunnit’. Many folks thought it was great, so I seem to be a minority! This sounds good… I’d keep reading. Hope you enjoy it! Oh, I love Peter May’s books or at least I’ve loved the ones I read. Yes, I’d keep reading. I’m not sure I knew about this one. Will be on a search to find it. Yes I would really love to keep reading and u cover the mystery of what they are hiding. I enjoy books that feature two stories because it’s fun to see how they intertwine. This sounds like a good one. I’m not familiar with Peter May, but I like the excerpts you shared and the synopsis too. I’d like to read this one. I like the sound of this one a lot and have never read anything by the author. Sounds interesting – I think I’d be tempted to read on. I read this and although I didn’t love it in the way I did the Lewis Trilogy, it was an interesting, engaging and believable story. I hope you enjoy it. I haven’t read anything by him, but I do love the way he writes from this little bit. Keep on reading!